The Czech Hiking Markers Standard is an international system of hiking markers for tourist trails, used in more countries than any competing standard. The signs and markers can be used in both wilderness and cities. The trail usually starts with arrow signs with names of destinations and number of kilometres marked. 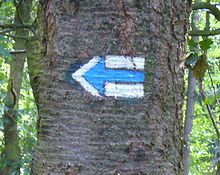 Each trail is then color marked by simple markers and arrows painted between white lines (for better visibility) on fixed objects along the trail (trees, rocks, utility posts or walls) in a color given to a specific trail. The basic system of trails with markers painted along the trail can be complemented by other features. These additional features are not necessary for the basic functioning of the system though. Information boards along the trail, giving information about the trail, nature protection, monuments, animals and trees along the trail. Logos of the supervising institution can be shown. Printed Maps with colored lines showing the trails. This method of trail blazing has a wide international usage in most of Central and Eastern Europe (including the Balkans and Caucasus), with showcase examples also in parts of Latin America and Asia. The system has been used by the Czech Hiking Club since 1888. The entire territory of the Czech Republic is covered with marked trails, and detailed maps are published and widely available. In the Czech Republic, over 70,000 km of hiking trails have been marked in this way. 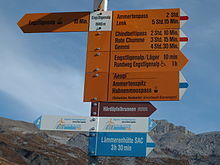 Of these, 39,816 km of hiking trails were marked in 2008. An additional 31,104 km of cycling trails, 387 km of skiing trails, and 1300 km of horse riding trails are also marked. In 1938 it was the longest system in the world, but now it is the densest network. 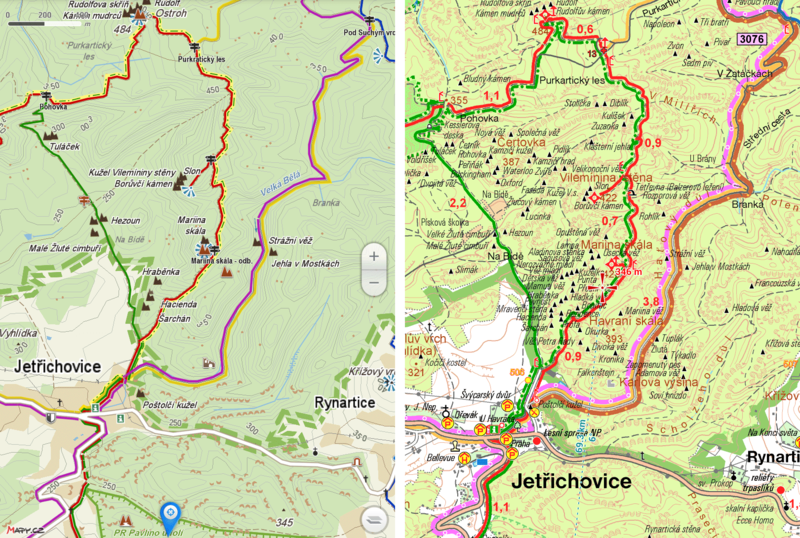 Maps of the trails have also been made into a number of digital applications - both Apple and Android for mobile phones, on Google Maps, and on the Czech "Mapy.cz" (and its version for foreigners called "WindyMaps"). yellow and green for easy or interconnecting trails. These marks may be posted on wooden boards or metallic plates. Basic trail markers are square, 10x10 cm in size. The volunteers marking these trails usually prepare sheet metal or cardboard matrices to keep the signs uniform in size. Any change of direction is marked with arrows of the same color and similar design. The system is usually supplemented by maps, which show the trails as lines in corresponding colours. Nevertheless, maps are not necessary for the system to function, as walkers can simply follow the trail from marker to marker. Due to the relative ease of use and low cost, the system has spread to many other countries, often by Czech people. Originally used in the Czech Republic, the system spread through Central Europe and Eastern Europe and even to countries outside Europe. Nearly identical systems exist in the neighbouring countries of Austria and Poland. Austria's standard is almost identical, with red-white-red stripes used instead of white-red-white The same colours are used in the Czech Republic for cycling trails. Croatia especially on the island of Krk, with a map available in local tourist centers. The Czech Tourist Club marked a network of historical goat trails that can now be used by tourists hiking in the mountains. Georgia - Caucasus trails marked by Czech volunteers, particularly the mountain border between Georgia, Ingushetia, Chechnya and Dagestan. Poland - these markers are especially common on trails near the Czech and Slovak borders. The system is a slight expansion of the Czech model, adding black to the four colors used in the Czech markers. Romania - 300-400 km of trails marked by the Czech Tourist Club in the Banat region, as well as a 360 km mountain trail leading from Slovakia across Ukraine to Romania. Ukraine especially in Subcarpathian Ukraine and Crimea with some 700 km of trails marked in 2011 in Subcarpathia and continuing efforts by Czech, Ukraininan and Polish volunteers to mark additional routes with part of the program sponsored by the Czech Ministry of Foreign Affairs. Maps of the trails are available. ^ Farley, David (6 July 2008). "Hiking in the Czech Republic". The New York Times. Retrieved 25 November 2016. ^ a b "Zonal map" (JPG). Mapis.cz. Retrieved 2017-03-25. ^ a b "Czech Trail Marking System the Best in the World". ^ "Map showing markers on route" (PNG). Androidtip.cz. Retrieved 2017-03-25. ^ "Czech Tourist Klub (KČT) | KLUB ČESKÝCH TURISTŮ". Kct.cz (in Czech). Retrieved 2017-03-25. ^ "Hiking in the Czech Republic". Retrieved 25 November 2016. ^ "České turistické značky najdete i v Brazílii. Možná budou v celé zemi - iDNES.cz". Cestovani.idnes.cz. Retrieved 2017-03-25. ^ a b "S dokonalým českým turistickým značením se potkáte na ostrově Krk i v Bulharsku u Dunaje | Dopolední expres". Rozhlas.cz. Retrieved 2017-03-25. ^ "About the signs of the paths". National Blue Trail. ^ "Committee on Israel Trails (Hebrew)". ^ "Crossing the Polish-Czech Border on Foot". Polishnews.com. Retrieved 2017-03-25. ^ "Hiking in the Tatra Mountains. Private Walking Tours in the Tatra National Park". Discoverzakopane.com. Retrieved 2017-03-25. ^ "A Guide to Hiking the High Tatra Mountains – Poland and Slovakia". BootsnAll.com. 2010-04-19. Retrieved 2017-03-25. ^ "Český Banát - Romantické prázdniny na českém venkově v Rumunsku - Nové trasy". Banat.cz. Retrieved 2017-03-25. ^ Pavel Novák. "České turistické značky ukazují správný směr i v rumunském Banátu | Evropa". Rozhlas.cz. Retrieved 2017-03-25. ^ "S obnovou Jubilejní karpatské stezky, která vznikla před sto lety, pomohl kraj - Orlický deník". Orlicky.denik.cz. 2016-01-16. Retrieved 2017-03-25. ^ "System of the marked hiking trails in Slovakia". Slovakation.com. 2017-03-16. Retrieved 2017-03-25. ^ "Kam vede červená? aneb budovali jsme turistické značení v ukrajinských Karpatech". Treking.cz. 2013-02-27. Retrieved 2017-03-25. ^ "České značky přinášejí naději (Česká republika) | Lidé a Země". Lideazeme.cz. Retrieved 2017-03-25. ^ "České turistické značky na Krymu". Mzv.cz. Retrieved 2017-03-25. ^ "Туристичні маршрути. Карпати. Великий Березний (г. Явірник - г. Красія) | Картография". Ukrmap.com.ua. Retrieved 2017-03-25.